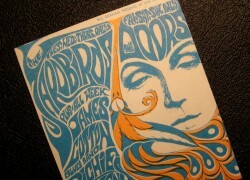 Item description: An iconic concert ticket dating from 25th July 1967, for the Yardbirds and Doors. 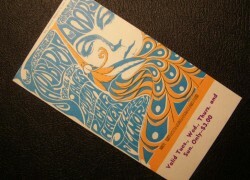 The artwork to the ticket is classic psychedelic sixties designed by the famous artist, Bonnie MacLean. 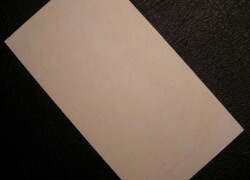 The ticket with torquise blue and orange inks on white card, with purple validity dates to the base. MacLean’s signature appears at the base of the actual artwork, but is only visible under an eye glass. 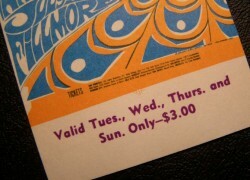 Background to MacLean / Filmore tickets: Before the days of computers, bar codes, and bar code scanners, Bill Graham Presents, used the artistic services of Bonnie MacLean, and printed their own concert tickets in high quality letterpress form. Many of these tickets are now considered mini-works of art in their own right. Small facsimiles or derivations of the show’s promotional posters, they were typically color-coded to indicate multi-night engagements and represent a bygone era of extended, one-venue engagements by major performers. To allow sales to be reconciled each night, patrons purchased tickets at the venue box office, but then handed them right back over at the door. Due to this, most of the tickets were simply destroyed after use. Those that have survived tend to survive in mint condition.